Recently Proof GmbH made available in their proof online shop the new US Proof Standards of SWOP and GRACoL with their 2013 profiles. Unlike the new Fogra51 and Fogra52 profiles from their Munich colleagues, the IDEAlliance have pushed their new standards forward and published new M1-based profiles already in 2013 – M1 meaning, that the new standards are measured in consideration of optical brightening agents (OBAs), and also contain a different white point than the previous SWOP and GRACoL profiles of 2006. The release was perhaps a bit too early – even the Americans feel uneasy. So several documents of IDEAlliance regarding GRACoL 2013 and GRACoL 2006 almost discourages a necessity of a change towards the new profiles. 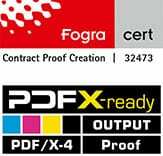 LAB values ​​of the primary colors, white paper and more have of course changed, therefore the reluctance can be explained only by a degree of uncertainty, as the Fogra and the ECI will implement their new Printing Conditions Fogra51 and Fogra52 at the end of September 2015. But ont thing is for shure: When it comes to dot gain and paper white, the American profiles are noticeably different from the new PSOCoated standards of the German Fogra. The Proof GmbH has already implemented the new GRACoL and SWOP profiles and provides proofs with the new printing conditions. The profile is measured in M1 mode in consideration of optical brighteners and is printed on proofing papers with optical brighteners. The profile is measured in M1 mode in consideration of optical brighteners and must be printed on proofing papers with optical brighteners.